Now that you've found me, thanks for visiting. Now that you know the way, I hope you return often. 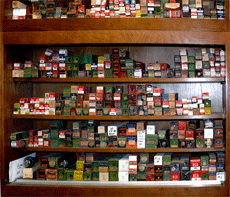 of tubes and parts for most of the more popular Radios from the Vintage Era. 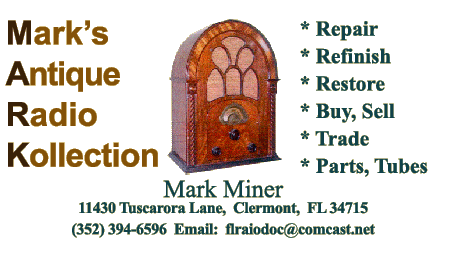 I'm Mark Miner, Proprietor of Mark's Antique Radio Kollection and known throughout the world as 'The Florida Radio Doctor'. I've been collecting, repairing, refinishing and restoring vintage tube Radios for most of my adult life. As with many avocations, it started as a hobby and became something I soon realized I could truly enjoy doing for the rest of my life. 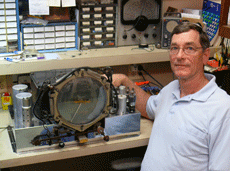 From the earliest crystal sets to one of the most sophisticated and prized tube-powered Radios ever produced--the Zenith Stratosphere 1000 Z--I've learned to employ that extra measure of investigation, research, preparation, skill, and love that it takes to successfully repair, authentically refinish, or perfectly restore these wonderful, tube-powered treasures. 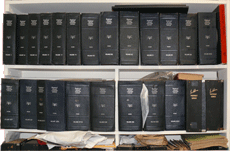 An extensive library of original manufacturers' repair manuals and parts manuals are absolutely essential. I keep a huge inventory of authentic, original equipment, vintage tubes, capacitors and other parts to provide the most authentic, accurate and precise repairs and restorations possible. I maintain contact with a vast network of other collectors throughout the world. We readily share whatever information we can provide to each other regarding a specific brand or model. 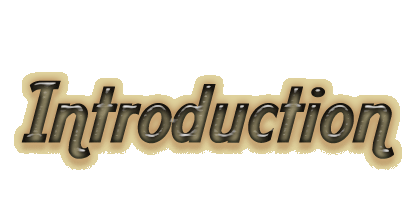 If I can't find an immediate source for a part or instruction, I can usually obtain at least an answer from the network within twenty-four to forty-eight hours in most instances. There were literally hundreds of thousands of replacement tubes, caps and other critical repair parts available as late as the 1970s, but they're becoming harder and harder to find and obtain. I often spend as much time finding reliable stores of replacement tubes and supplies as I do in researching specific models and their details. But every minute spent on research pays big dividends toward a quality restoration or repair. I have an extensive, two-story, climate-controlled, moisture-controlled warehouse, parts store, and repair shop on the premises. 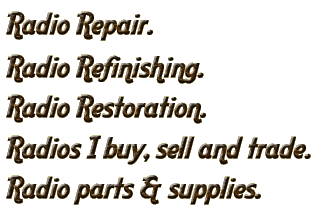 I employ the finest hand tools and equipment currently available for my repairs and restorations. I'll be posting some examples of both past and present projects from month to month, from links you'll find here. I treat each of my projects as if they're my own--at least until the last moment that I return them to their owners. I suppose it's like taking in a foster child until that moment they find a permanent family. That's as good an analogy as I can think of, in any case. And yes, it's hard to let some of them go. But I know in each case that they'll be entrusted back to the owners that care for them the very most. 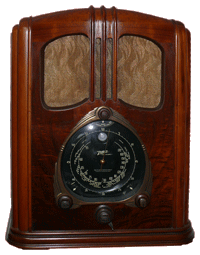 The common denominator in all of these fine examples of early to mid-20th century engineering is the incomparable sound that only a tube-powered radio or amplifier can impart. 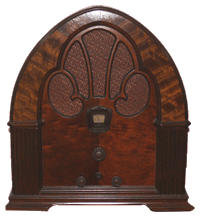 Despite all of the extraordinary technological advances in transistor and micro-circuitry technology dating from the mid-20th century until today, nothing yet approaches the full, mellow sound from a tube-powered radio chassis. Sadly, the means of comparing that incredible, robust sound to today's artificially shaped sound technology remains a finite resource. 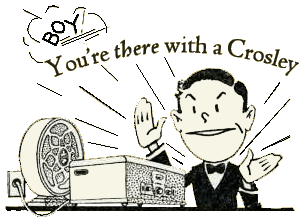 But if you truly love that tube-powered sound, there's only one real way to obtain it. One thing's for sure. Once you hear the difference there's no turning back.